Fascinating Rhythm – JFR Success! Posted 15.03.2018 by Fascinating Rhythm & filed under Competition, News. This year, we were determined to get things 100% right – so lots of plans were put into place to make our journey to the competition the best it could be. Solos – 6 Junior FR girls decided to take part in the Thornbury solo competition this year. Music was sourced and chosen and tweaked to match every girls’ vocal range. Teach tracks were made and private lessons began. The girls also spent time with Kitty on presentation and Ali on vocal excellence and Charmaine (our piano accompanist), to get as fully prepared as possible. The girls were also given some performance opportunities, and came along to FR on Thursday 8th March to perform in front of FR and on the 9th March to all the parents from Junior FR. The competition began at 9.00am on Sunday 11th March (Mother’s day). Lily Howse sang “Let’s go fly a kite”, Anna White sang “Somewhere out there” and Edie Wong sang “Tomorrow”. All in the under 11 stage and screen section. It was a Junior FR hat trick! Anna scored a massive 89 marks and won the trophy. Lily came second with 88 marks and Edie came third with 87 – distinctions for all. Hannah Sharp had a tough section singing “On My Own” against 9 other competitors in the 14 and under stage and screen section. She came a very respectable 3rd place and gave a very moving performance. Ella Carrick had an amazing day. She sang “I’m not that girl” from Wicked in the 18 and under section. Competing against 6 others, she gave a very emotional performance and took the first place trophy. Our last singer of the morning was Jessica Page – singing about “a windmill in old Amsterdam” in the 11 and under folk song section. She gave a brilliant performance and was given 88 marks (another distinction) and came 2nd. It was a fabulous morning; the adjudicator was brilliant and has given us lots of advice. I am hoping to book her to come and do a workshop with the girls in the future. To top it all, Lily has since been asked to represent the junior sections and perform at the Eistedfodd concert on the 23rd March. What an honour, and of course we said yes. 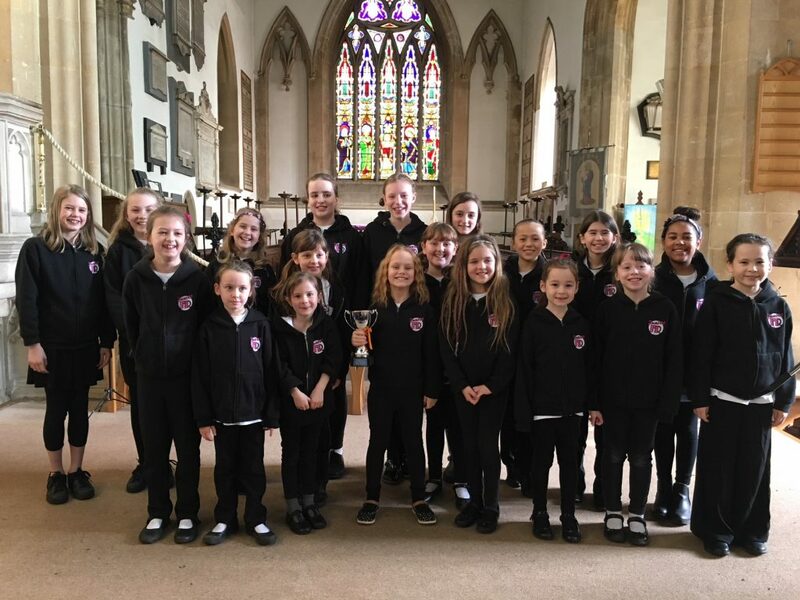 Choirs – We decided to split Junior FR this year, as our numbers are growing and we have 9 very competent secondary school girls, who we thought needed more of a challenge. Song choice has always be key to these competitions – finding songs that are challenging but that can be sung well. The Juniors (directed by Wendy Howse) and supported by Nic Page, Claire Bevan and Melanie Edwards sang “The midnight Tango” from Roald Dahl’s Cinderella musical and “The Little Sandman”, a poem set to music by Brahms. The girls really benefited from the same performance opportunities as the soloists on the lead up to the competition. They seemed fearless as they took to the stage (in St. Mary’s Church – Thornbury) and delivered their package perfectly. They even managed to sing in 3 part harmony, unaccompanied and stay in pitch. They competed against 5 other schools in the 11 and Under competition; Crossways; Tockington Manor; Christ the King; Frampton and Manorbrook. Whilst all the other performances were lovely, no-one delivered like Junior FR and we took first place and a trophy. On top of that, we had so many lovely compliments for other schools and Eistedfodd staff, which was the icing on the cake. The seniors were entered into a new competition this year. 18 and U (small choirs) – against Tockington Manor and The Castle School Chamber Choir. Our girls sang “The Winter Carol” and “Sing”. Directed by Kitty Davies and supported by Chloe Roberts, Ali Jack and Joan Josey. The Castle school choir also gave a solid performance, and the adjudicator found it very difficult to decide who should come first. We were just beaten by one point (but still scoring 87 – distinction) and so were awarded 2nd place. We are so immensely proud of both choirs and incredibly grateful to Wendy Howse (MD) and the whole JFR team. We are also so very fortunate that Valerie Shelton, gave up her time to accompany the girls again this year and once again played the piano beautifully for us. This weekend (17th March) see’s the soloists (plus Alice Grubb), compete in the Bristol Eistedfodd. 28th April we will be taking to the stage as we have been invited to sing in The Frampton Male Voice Choir’s concert – in aid of Cancer Research. May Day will see us on the side of a lorry (stage), as we entertain the crowd. And we hope to be involved in The Thornbury Carnival – we are just waiting to hear.